Last Saturday, Felistas and I were in Kitwe where I was officiating and preaching at the wedding ceremony of Mubiana Mukubuta and Patience Namangala. The families also asked me to fulfil the role of Guest of Honour, which involved a short speech to the couple during the reception that followed in the afternoon. So it was a full programme for me that day. Now, that is an understatement. Patience had been my office assistant at Kabwata Baptist Church for the previous two and a half years, and so this wedding was a major loss to me. I described it as a bittersweet event. 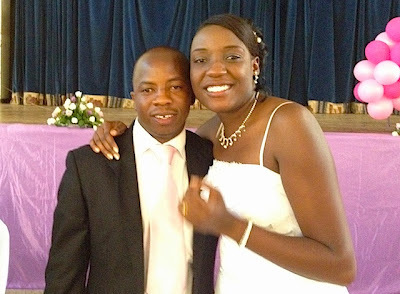 I rejoiced with her as she entered into Christian marriage and also rejoiced with Mubiana for the gift God had given him. But I also realised that she was leaving behind a gaping hole in the office that would be well nigh impossible to fill. Let me explain. Some of the readers of this blog will know that I once thrived on the sweat of a most efficient office assistant for about ten years. Her name then was Lumpuma Chitambala (now Mrs Kayombo). We became like a left and a right hand in the office. She was hard working and would often predict what the issues were that needed attention and prepared for them adequately. I could be anywhere in the world preaching and would have full confidence that nothing in the office at Kabwata Baptist Church was being neglected. This went on for a solid ten years, until a pastor in Kitwe “saw the light”! I have commended him many times for getting a package of two—a wife and an office assistant—for the price of one! When Lumpuma got married and the search for her replacement commenced, I was sure that there was not her equal on this side of the planet. So, I was not really searching. I was mourning…until one evening, by sheer coincidence (humanly speaking), Felistas and I showed up at Patience’s home. We were not looking for her. We were looking for a home of a new church member and Felistas was hoping to get directions from Patience’s housemate. The housemate was not around and so Felistas suggested we spend a few minutes chatting with Patience instead. As Felistas and Patience chatted, all her answers gave me the assurance that Lumpuma’s replacement had finally been found. To my surprise, when she was offered the job two days later, she revealed that she had applied for the job 10 months earlier, as soon as she heard that Lumpuma was resigning. I had never seen her application papers. It was clear that the Lord had kept the job for her because in the 10 months there had been a number of applications but my heart had not felt at peace about them all. God moves in mysterious ways! Well, that was in September 2009. You need to realise that Lumpuma had set a very high standard for that office. I feared that anyone replacing her would soon be a disappointment. I am also a hard taskmaster. I want to see quality work. Add to this the fact that KBC is a mega enterprise, with so many things happening at the same time. I trembled for Patience. I hardly knew her beyond those few minutes Felistas and I spent in her home. How was she going to fare? Patience stepped into Lumpuma’s shoes and became a modern Cinderella, with Lumpuma’s shoes fitting her in fairy tale style. Let me very briefly describe what I mean. Patience brought to the KBC front office the warmth and charm of personality that is her signature. Many visitors to KBC testified of this. Yet in the background she was also very efficient and hardworking. I also can testify to that. Patience was also a very fast learner who took her role as my office assistant as if KBC’s future depended on her. I would often walk past her office, see her working away, and marvel at how God answers prayer. In the period she worked in my office, there had not been a single complaint from anyone about her—not from the church elders and deacons, not from the church visitors, not from her fellow members of staff, not from any church members—no, not one. From the time she would report for work to the time she would knock off (and usually she was among the very last to leave the office) she was ever working. Sometimes even when she was unwell, she would still come to work and insist that there was work to be done and until she cleared that work she needed to still be in the office. We have office devotions every Tuesday and Friday, and Patience made them top priority not only in attendance but also in active participation in them. During those devotions, she prayed for KBC with a sense of personal attachment. I will end her praises here, lest if she ever reads this she gets puffed up—which would be of no advantage to her. I have lost a great office assistant again. I am in a state of mourning again. Another man from Kitwe “saw the light” again. I need to lodge a formal complaint with the mayor of Kitwe about this trend—unless, of course, Mubiana is seriously praying about relocating to Lusaka. We must wait and see. One thing is sure, my loss is his gain! 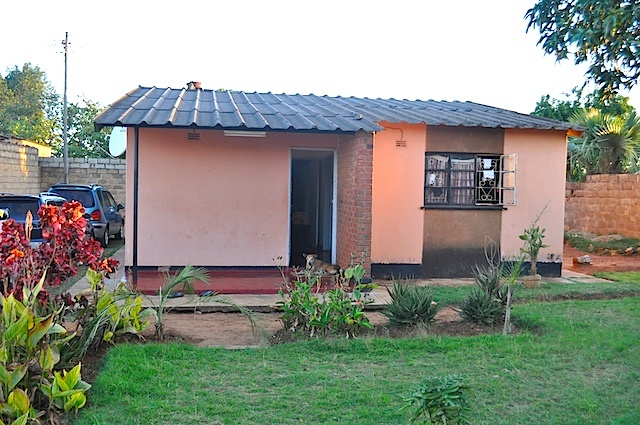 The First KBC Pastor’s House Purchased—And Two Souls Saved! Yesterday was a most wonderful day. It was one of those days when I sensed the presence and nearness of God in an unusual way. It was not that way from the beginning of the day. Oh no. The day was largely spent in the library of the Baptist Theological Seminary, working on an article for the South African Baptist Theological Journal. However, at midday I received an email that at 17.30 hours the estate agent would be handing over a house that KBC had purchased for the use of our growing internship program. This whole story needs to be told to the glory of God. Earlier this year, one of our missions partners wrote me, telling me of his burden. He felt that they should do more for our missions partnership than they were currently doing. He asked a basic question. What is it that we wanted to do for the great cause of Christ that we were not doing simply because of the lack of finances? The answer was soon sent to him. We were getting requests to take in pastoral interns from right across Africa (and some requests were now coming from outside Africa!) but we lacked the capacity. We were only managing two—or at the most, three—interns at a time. However, we needed to provide for about five or six at any one time. So, if only we could buy two houses near KBC to accommodate them and have some finances for their pocket allowances while they were with us, this would fling open the sluice gates. Well, to cut the long story short, the brother gave us the green light to look for two houses to purchase. 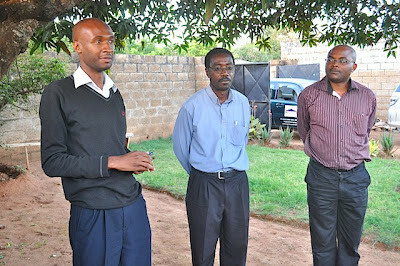 Our church officers asked one of our deacons (Logan Nyasulu) to begin the house-hunt in the area near the church. Since he worked in the real estate industry, he simply sent out word among the real estate agents. Within a few days he got a call that a house was being sold a few streets behind the church. When he went with the estates agent, he was led to house number 45, Boli Street, in Libala Stage One. My eyes are filled with tears as I write this. 45 Boli Street was the house Felistas and I lived in for the first seven years of my pastoral ministry at KBC. It was our first home as a married couple. We moved in straight from our honeymoon. It was the home in which all our children were born. It was the home in which I counselled many teenagers who are now married, with families, and making their way up the corporate ladder—including Logan himself. In fact, he could not contain his own joy when the estate agent led him there. 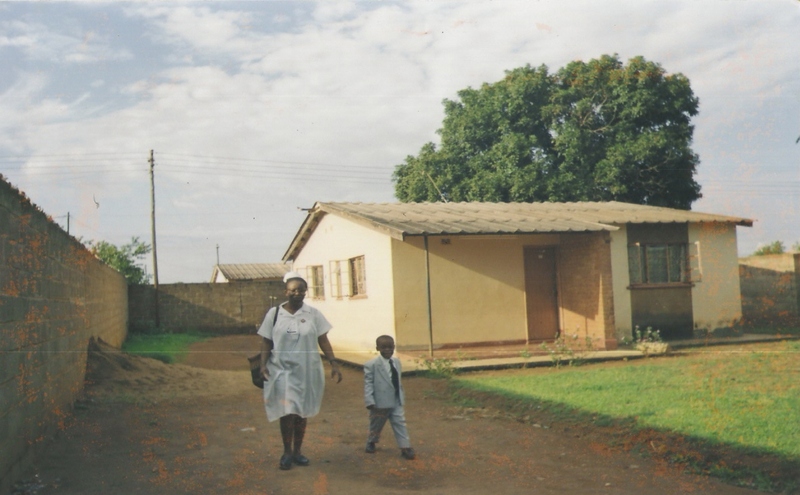 We left that house in 1994, when the church built the pastor’s house on the church premises. Here I was now, back to that little house—eighteen years later. Felistas and Mwindula, with 45 Boli Street in the background, once upon a time! I felt as if I was walking on hallowed ground as I went around this small three-bedroomed house. I peeped into what once was our master bedroom, where I first brought my young bride. I looked into what once was the study, in which the sermons of the first seven years of my pastorate were born. It was in that room that I often knelt and prayed for God’s blessing upon my family and his flock at KBC. Flashes of those early years came to mind with almost overpowering emotions. This would now be the home to be occupied by our interns. May the Lord fill their hearts and minds with the great theme of his kingdom and his glory that enlarged my own heart in those early years of ministerial labours at KBC! with the current tenant of the house (middle) listening. As if this was not enough, while I was at the handover event, I got a call from a couple that I have been visiting for evangelistic purposes since July last year. Let me also narrate this event. I think it was even sweeter than what I have just narrated. Last week I was particularly burdened about this couple. In the home group last Thursday, I specifically asked for prayer for them. When one of our elders sent me a text message that he was praying for me, I immediately asked him to also pray for this couple. During the elders' time of prayer before the morning service, I again specifically asked for prayer for them. During our family and office devotions I also asked for prayer for them. God gave me a burden for them all week. Here is what happened last evening. While I was at the new KBC interns' house, the wife called and asked if I was visiting them that evening. That surprised me because it was always her husband who used to call. In the ten months of visits, we have had evangelistic Bible studies in the parables of Jesus. 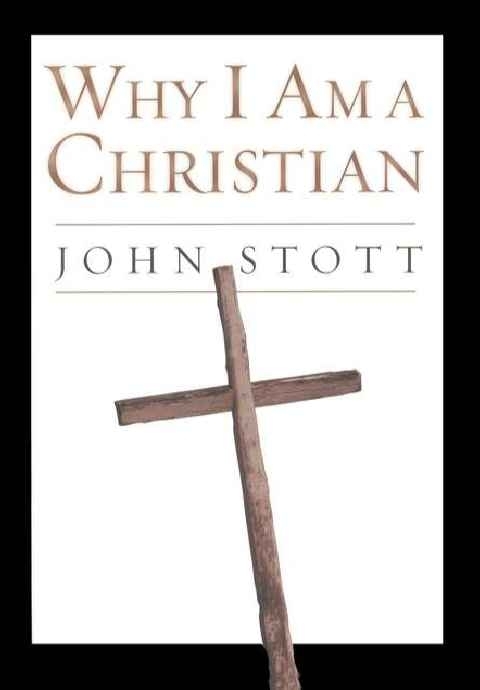 We have read together John Stott's book, Why I Am A Christian. Recently, we went through Al Martin's booklet, A Bad Record And A Bad Heart. 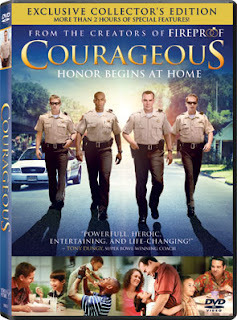 Last week, we had reviewed the DVD Courageous. Last evening, we were reviewing the DVD Fireproof. I always led the reviews to the point where salvation in Christ was the answer rather than some program or resolutions. When we came to the end of last evening's review, I asked what was still stopping them from surrendering their lives to Christ in the light of this. The wife asked whether a Christian could backslide. And as she was asking, she began to shed tears. She explained that she had a very, very close non-Christian friend. She visited her that afternoon and felt she was being a hypocrite by pretending that she was still the old person when she had changed on the inside. So, could she backslide if she continued relating to this friend of hers? As she was asking this, she was shedding tears. I knew instantly that the Lord had saved her. I asked what had happened. She explained that on Saturday, while visiting an aunt, a pastor there talked to her and the others about the importance of asking themselves why they do what they do. She said that was the last straw. She got back home and went into her bedroom and cried to the Lord to save her. She literally wept. She said that at some point the burden just lifted and joy filled her soul. "I don't know whether I just wanted to be happy and so convinced myself that I was now happy. But I really experienced joy and it has been like that ever since!" I turned to her husband and said, "Well, you have heard your wife's testimony. What about you?" His reply was, "I am not an emotional person and so my testimony is not like hers. For me it was last Wednesday when you showed me that what mattered was not 'faith' or 'the right attitude of mind' but Christ. That was it. That is where I always got it wrong. Up to that point, I was concentrating on getting my faith and mind right. Now I know that what I simply needed was Christ himself." I asked both of them what answer they would give Angel Gabriel at the door of heaven if he asked them why they should be allowed into heaven. Their answers had no mention of good works or church going. They simply said, "Christ came and died for our sins" (period). All this amazed me because every week for the last ten months this is what I had been seeking to make them see and they could not. So, I am excited for them. It has been a long journey. Ten solid months of weekly visits (whenever I was in town!). They had one advantage. They were always sincere. They never tried to pretend that they had given their lives to Christ when they had not. On a few occasions they would say to me, "Pastor, we know you must be feeling discouraged. We must be a real disappointment to you." I would say to them, "Don't worry, as long as you are still interested in me coming to visit you, I will continue to come. The day I notice that you are deliberately avoiding me, I will go to another home." Well, as it turned out, their sincerity finally paid off. I could not miss the joy, especially on the wife's face, even as she kept wiping the tears from her face—tears of joy! When I got home, I sent both of them text messages saying, "This has really been a great day for me. If the Lord has really saved you, I feel as if I can even go to heaven. It's been worth every visit. Praise God!" The husband's reply was, "Pastor, I am really thankful for showing us the pathway to the kingdom of God. I am getting stronger and stronger spiritually." The wife's reply was, "Praise God, indeed. And thank you for everything." What more can I say? It was a most wonderful day, indeed! It Has Been A Great Sunday Today! This day began with the realisation that almost all my Zambian pastoral friends were ministering outside the country today. 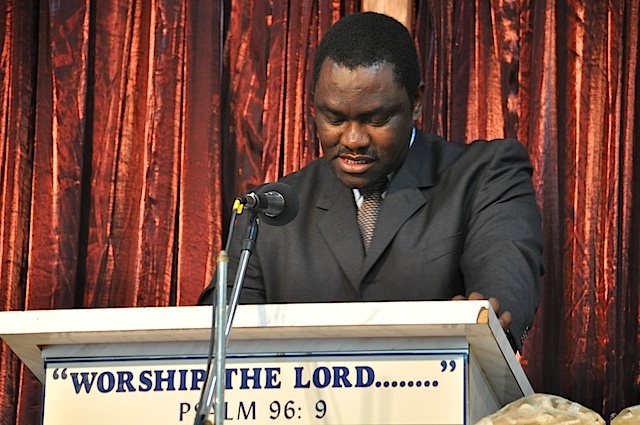 Intelligence has it that Choolwe Mwetwa, pastor of Central Baptist Church in Chingola, was ministering in Namibia. 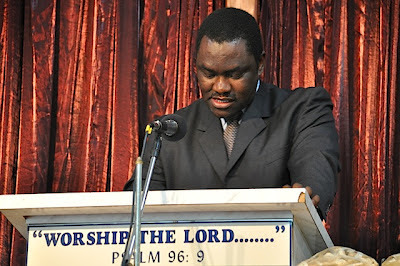 Ronald Kalifungwa, pastor of Lusaka Baptist Church, was ministering in Kenya. Victor Kanyense, pastor of Mount Makulu Baptist Church, was ministering in South Africa. 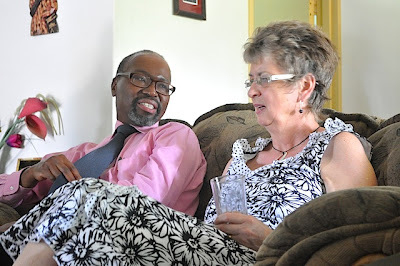 Isaac Makashinyi, pastor of Emmasdale Baptist Church, was ministering in the USA. I could add to this list Saidi Chishimba, pastor of Riverside Faith Baptist Church, who was in Australia. 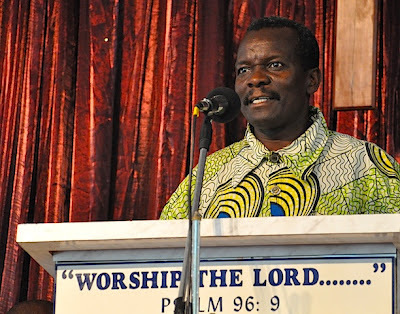 Francis Kaunda, former pastor of Chipata Compound Faith Baptist Church, was ministering in South Sudan. Phil Hunt, former pastor of Riverside Faith Baptist Church, was ministering in the USA. I highlight all this, firstly, because it makes me feel like an angel (smile!). 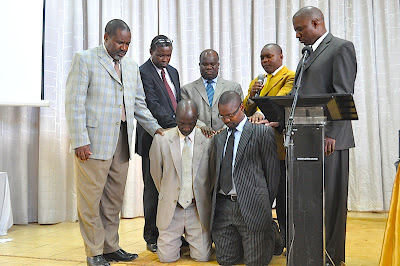 But on a more serious note, what does this say about our responsibility as a church in Zambia? The fact that our pastors are ministering all over Africa and the world says that God has given much to us as a nation and we are now sharing his gifts with the outside world. We need to stand with these men, most of whom have left their families back home, so that they may know God’s blessings upon their labours. Let us pray for them as they minister out there. At Kabwata Baptist Church (KBC) today we had a baptismal service in the morning. 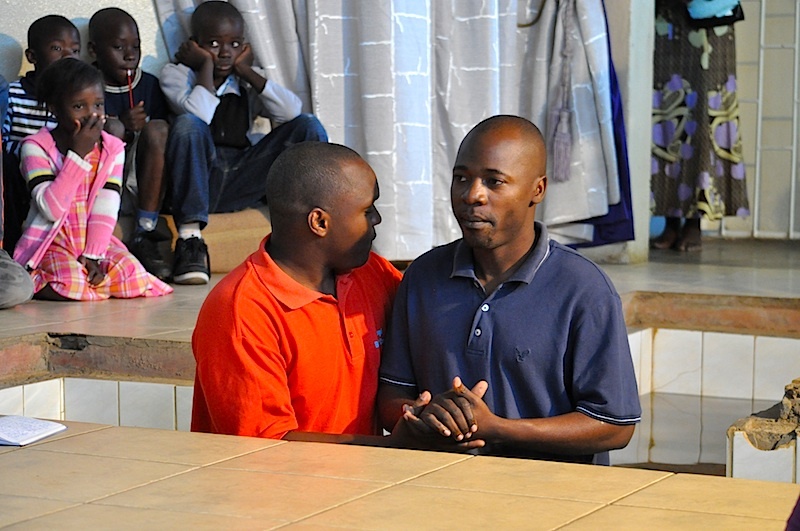 Nine individuals were baptised by Pastor Chipita Sibale. 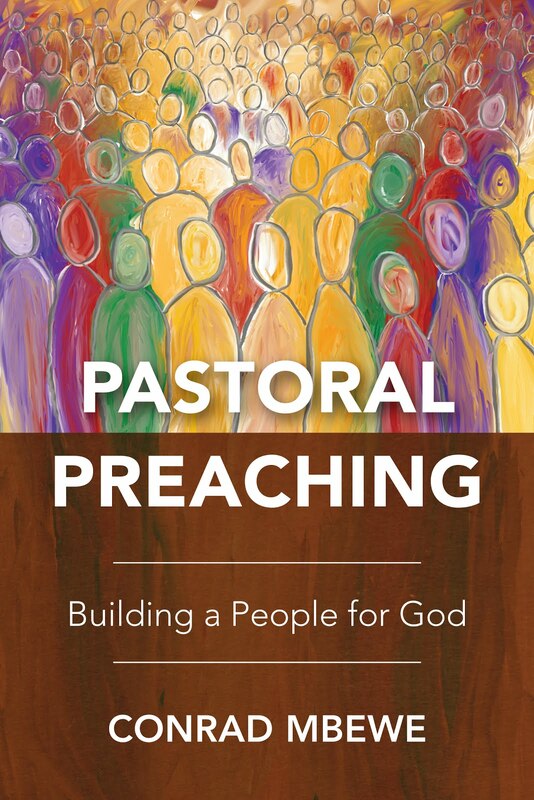 About half of the individuals have become Christians through the various ministry avenues of the church and the pulpit ministry in the recent past. This is how it should be. I mentioned afterwards that we do not make altar calls at KBC. This is because there is nowhere in the Bible that anyone makes an altar call. Someone once asked, “How, then, do you know who has given his life to the Lord?” My answer was, and still remains, “Through the baptismal pool.” In the Bible, the call was not, “Those of you who repent and believe come to the front.” Never! It was always, “Those of you who repent and believe, be baptised!” That was what we witnessed this morning. We long to see more and more individuals responding to the gospel and coming to ask for baptism. That is how it should be. Finally, this evening, we had the ordination of two deacons. Bobbline Cheembela and Misheck Kumwenda joined the KBC deaconate today after the laying on of hands by the KBC eldership. Two positions in the deaconate had become vacant when one of our deacons, Stanley Musukwa, relocated to a farm on the eastern side of Lusaka after his retirement, and another deacon, Kasango Kayombo, was ordained as a missionary pastor. Today, the gaps have been filled. In case any of my blog readers are wondering where I am writing from, I trust that the photo below should be evidence enough that I am writing from home. I am keeping watch over the flock at home! “As for the mystery of the seven stars that you saw in my right hand, and the seven golden lampstands, the seven stars are the angels [messengers] of the seven churches, and the seven lampstands are the seven churches” (Revelation 1:20). 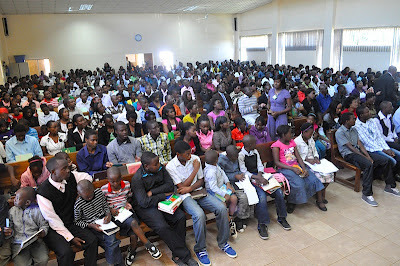 I returned yesterday from preaching at Ndola Baptist Church’s annual Easter conference. It was good to be there. I calculated that I preach there about once every six years. I first took a conference at Ndola Baptist Church in the year 2000 when I preached there on the theme of Christ’s Second Coming. You will recall that at the close of the last millennia there was hysteria everywhere that Christ would return before the year 2001. This series was meant to bring biblical sanity into this situation. Then I took another conference there in 2005, as Zambia was preparing for the 2006 presidential and parliamentary elections. The theme of those messages was “Christianity and Government”. I laboured to show in those sermons that government begins with self-government, and then flows into domestic government (of which church government is simply another form). It is only after this that civil government comes in. I also emphasised the importance of local government over state or national government—a matter that is wrongly reversed in Zambia and the world over. “Another development that took place during this time [referring to the 1950s] was the starting of English speaking Baptist churches in the country. These were started largely by, and to minister to, the English speaking expatriates who had come to work in Zambia, especially in the country’s mining industry. 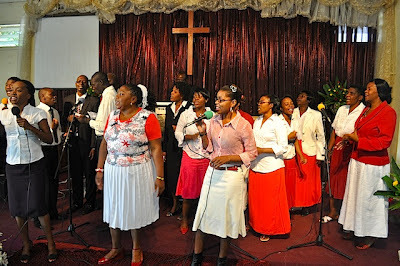 The first to be started was Ndola Baptist Church. This grew out of the Ndola Free Church that was using a building and manse owned by the Baptist Union of South Africa along Broadway Avenue. The last missionary pastor of the Ndola Baptist Church was Harold Homgren (1979-1984). 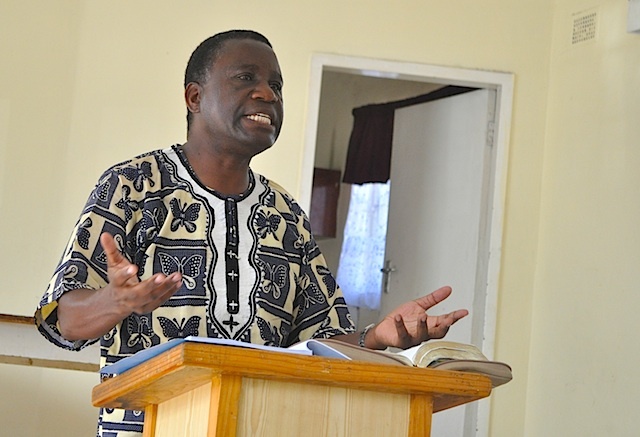 It is really unfair to call him a “missionary pastor” because he was born and bred in Zambia. His parents came to Northern Rhodesia (now Zambia) as missionaries in the first half of the twentieth century. It was his white skin that made the community feel he was foreign. In that sense, then, the first “indigenous” Zambian pastor was Joe Kapolyo, who served there for five years (1985-1990). He was followed by Wilbroad Chanda who also served there for nine years (1995-2008), broken by a spell of about four years. My own associations with this church go back to the 1970s, in my teenage years. I was in boarding at Chiwala Secondary School in Ndola. On Saturdays, Ndola Baptist Church used to send their church bus to pick up students who wanted to attend their youth activities. So, every so often, to get away from a Saturday that was threatening to bore me to death, I would jump onto this bus and enjoy the afternoon in youth activities and Bible study. I do not recall anything significant from those early associations, but I am sure the seed of the gospel may have been planted in my heart from those Bible studies. This year, Ndola Baptist Church called Grave Singogo to serve in the office of church pastor. Grave was until then serving at the Evangel Baptist Church in Lusaka. He commenced ministry there last month. While I was preaching there, excitement could be felt in the air. 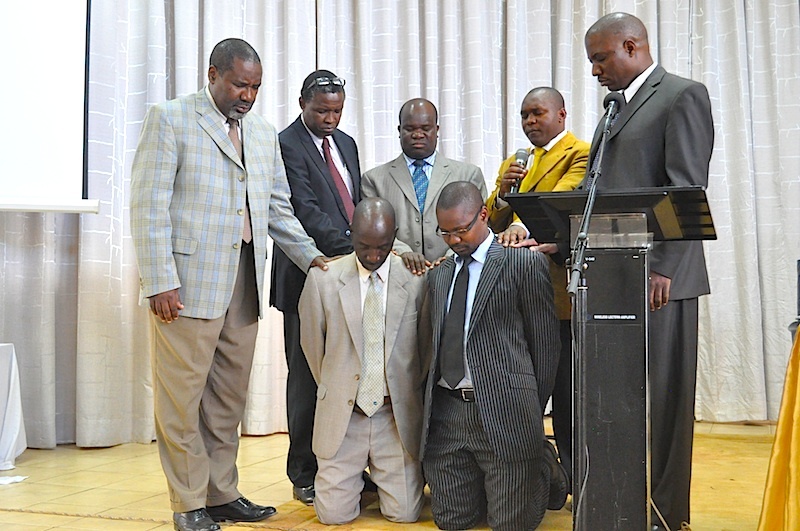 The church was overjoyed with the ministry of their new pastor. I pray that this will be yet another long and fruitful ministry that will bring many souls into the kingdom and help to maintain a conservative evangelical witness in the heart of Ndola. 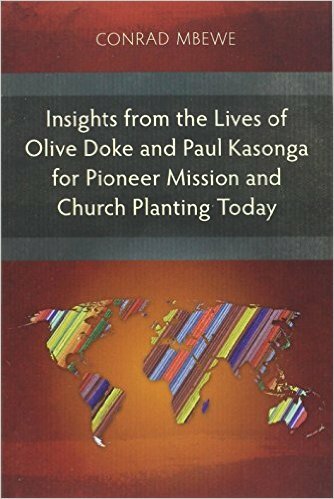 As I reflected on this visit, I was reminded afresh concerning the importance of church planting missions. 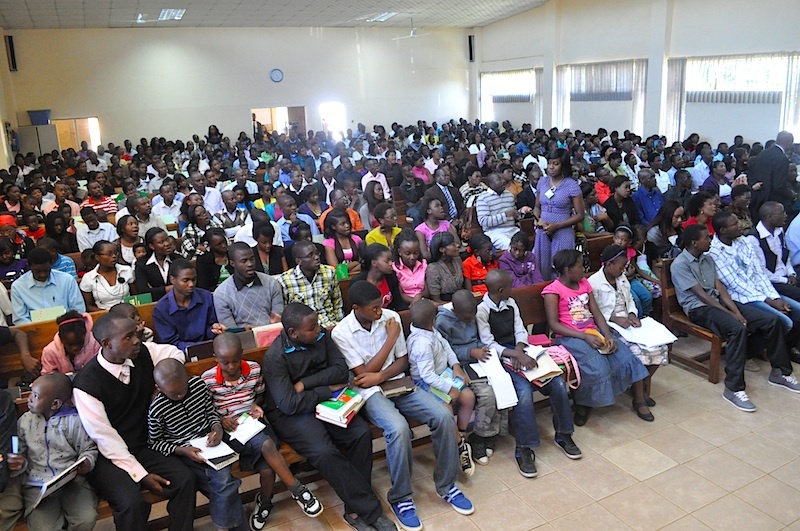 When the few English-speaking expatriates of evangelical convictions started the Ndola Free Church in 1931, they may not have realised that they were starting a dynamo that would continue to generate light eighty years later. All of them must have now been gathered with their fathers, and yet the work they began has continued to bear witness to Christ’s saving power. I am sure that over the eighty-plus years of the existence of this evangelical witness, and more specifically, the almost-sixty years of the existence of Ndola Baptist Church itself, the church has gone through its own four seasons. There have been summers of spiritual harvest, autumns of many people backsliding, winters of spiritual inactivity, and springs of fresh hope and life. All churches go through such seasons. 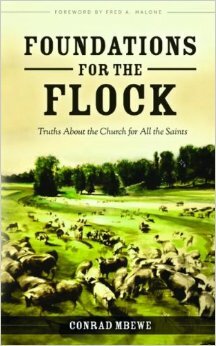 It is important to keep the spiritual vitality of the church going through all these seasons so that generations yet unborn may benefit from the lampstand that was erected in that place. Grave, and your fellow elders and deacons, the ball is now in your court!